The entire concept of soup is different in Eastern Europe. 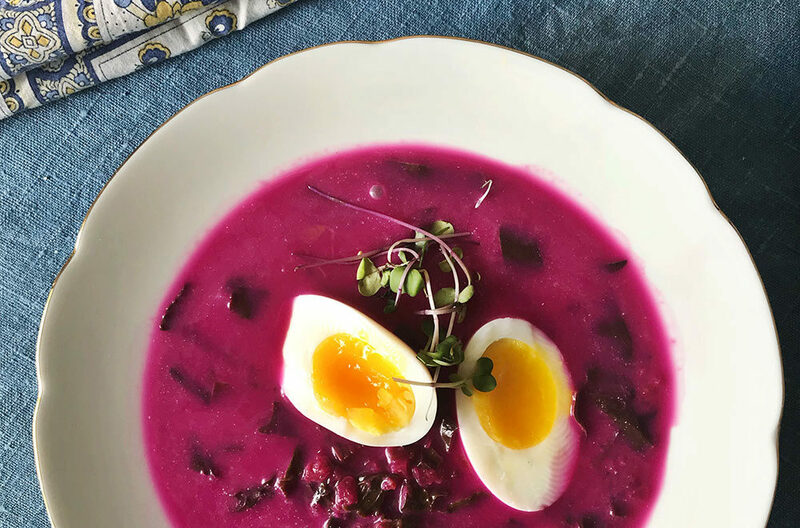 People in the UK find it hard to get their heads around the idea of cold soups or fruit soups, yet in the summer in Poland, we use soups to refresh us, or sometimes even as a sort of dessert. At my new supper club – A Slavic Tale – I want to explore this idea further, by gently challenging Western perspectives. Not only on the idea of soup, of course. Do you think of Eastern European food as meat heavy? Well, this is a vegetarian supper club. Do you associate Polish cuisine with potatoes? I use kasza instead (kasza is the word we use for all the grains as well as porridge). Do you think we eat a lot of beetroot? OK, actually that’s very true. 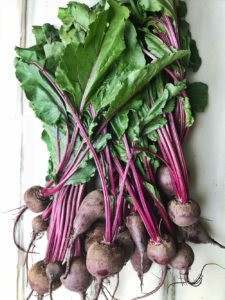 If you would like to make the fermented beet kwas, then simply chop up a beetroot, place it in a ceramic container with a bay leave, some peppercorns, some allspice berries and a chopped, red chilli. Cover this with warm, salted water (about half a tablespoon of salt in there) and leave to stand, covered with a tea-towel for 5-6 days. Then transfer it to a jar and keep in the fridge. Make sure the beetroot is always submerged under plenty of water. – Cook all the vegetables apart from the beetroot stalks and leaves with the bay leaf for about 50min in 2 litres of water. – Add the stems and leaves and cook for a further 5min on the lowest heat, then turn it off completely. – Add the lemon juice, sugar and season with salt and pepper to your own taste. – Allow to cool, then add the cream and fermented beetroot juice.